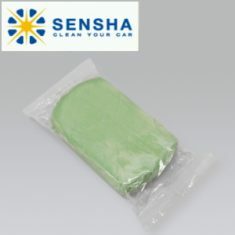 CLAY BAR FOR WHEEL - SENSHA CO., LTD. Remove stuck substances on wheels which can't be done by liquid type cleaner. Clay bar has become such an essential and important tool for car detailing. 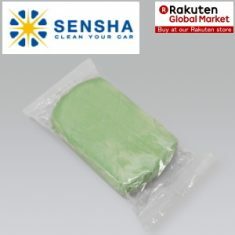 Clay Bar for Wheel is the special clay for removing stuck substances on wheels which can't be cleaned up with liquid type chemical cleaner. Basically when driving, wheels be in a high temperature state and easily absorb dirt which tends to be stubbornly adhered on the wheels. Normal dirt, can be dissolved by solvents. But on the other hand, in some cases, those stubbornly adhered dirt, brake dust, cannot be dissolved by solvents. Clay Bar for Wheel demonstrates its quality and strong removal power for those dirt. 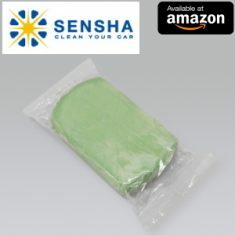 This can be use to rub the wheel surface and remove the dirt. For some of you who don't pay much attention on the wheel rims when washing your car, the dirt will stick on it and wheel is the area which not visually foreseen and remember that wheel is the easiest place to get dirty so much. Even if you leave wheels without cleaning for a while, you will find a lot of dirt stuck and serious contaminants. The more time passes, the harder to remove those dirt. Early actions are required. We have the wheel care products; Wheel and Tire Clean, Iron Cut and Brake Dust Cut. When you experience a problem of stubborn contamination, we recommend Clay Bar for Wheel. Stubborn dirt which cannot be dissolved by liquid agents can be completely cleaned up quickly without taking much time of work, Please be careful not to make scratches on surfaces. This product is a clay so that rubbing too much pressure could make scratches on surfaces. And it's a clay type so you can easily form in particular shape depend on the situation.